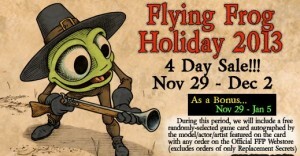 Flying Frog Productions, hot off the success of their Fires of Brimstone Kickstarter, have a holiday sale going on over in their webshop. All New products are now available, such as the LNOE: Hold the Line Supplement, LNOE: Blood In the Forest Pre-Order Pack, and ATOE: Dark Gothic Pre-Order pack all in the New category! From now until 1/5/14 get a free signed card with every order (Excluding orders of only ATOE: Secret Card replacement sets).